Today, I chat with Avi Silberstein, author of Human Solutions, a 1980s-Chile-based political thriller that Carmen Aguirre calls "gripping, disturbing, darkly funny, and impossible to put down." Avi was born in Chile, and he is a librarian in British Columbia, Canada. His short stories have appeared in publications including The New Quarterly and Grain. Human Solutions is his first novel. 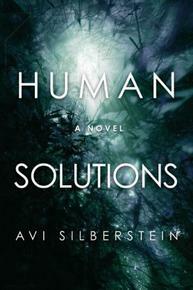 The first segment is the interview, while in the second, Avi reads from Human Solutions.